Facebook’s next billion users don’t have smartphones or even the Internet yet, but the Facebook Phone could change that. Through savvy carrier deals, subsidized handsets, and free limited data access, Facebook could ensure emerging markets come online with friend requests as their first experience. That could turn populations in southeast Asia, Africa, and Latin America into Facebook users for life. International plans and carrier deals are something we haven’t heard much about in the run up to Facebook’s big “Home on Android” launch event today. While handsets and software must be built by big teams, business deals can be easier to keep quiet. Few have speculated because there’s little evidence to go by. But accessibility has been the foundation of Facebook’s international strategy for years. Quartz has a great primer on Facebook Zero, a free text-only version of the social network offered through partnerships with local carriers that led to rapid growth in emerging markets like Africa. The idea is that Facebook wants to get feature phone users hooked on this stripped-down version of its service. Carriers subsidize Facebook Zero access in hopes their customers will pay to upgrade to a real data plan for full-fledged Facebook and the rest of the web it’s helped them grow curious about. Meanwhile, Facebook gets these international users jacked in early. They might not be worth much now. 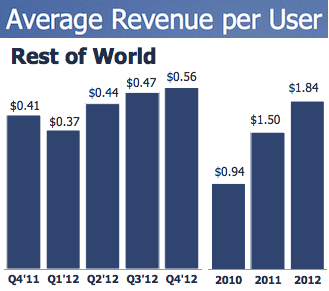 Facebook earns just $1.84 per user in the “rest of world” geography. But by the time the mobile world matures and they gain smartphones, their social graph will have proliferated and they’ll be locked into Facebook. The company gets to accomplish its mission of connecting the world as it primes its next wave of ad recipients. So where does the Facebook Phone come in? Well it lets Facebook accelerate that maturation. Facebook could work with HTC or other handset makers to develop budget Android smartphones, and partner with carriers to subsidize limited Facebook access. That could allow Facebook to hand out a smartphone that’s cheap or, to some extent, free to own and use. And on these devices, Facebook won’t be an option like its apps, Facebook Zero, or Facebook For Everyphone. It will permeate the experience. In exchange for distributing discounted introductions to the smartphone era, Facebook could gain users in the places it still has room to grow. Google and other companies have their own accessibility initiatives too, but this is how I see Facebook chasing the rest of the world. We might not hear much about this today. But in the long term, a branded phone is the natural extension of Facebook’s ongoing global accessibility plan. Everyone will have smartphones eventually, and there are big benefits for Facebook if they’re social by design.